100% of the people impacted are legal immigrants, and already have been hired by US companies. Many have advanced degrees including from US universities. All have made significant contributions to the US Economy. They are doctors, engineers, nurses, educators . . .and your neighbors! To US Medicare,State,SSN and Federal taxes over 10 years. Invested in US real estate (Rental,Home,Investment Properties) over 10 Years. Contribution to Overall GDP in 10 years (~$22 Billion/Year). Awarded to high skilled immigrants. Cars,Travel,Fees,ChildCare,Stocks and 401K over the course of 10 years. Had at least one immigrant co–founder. 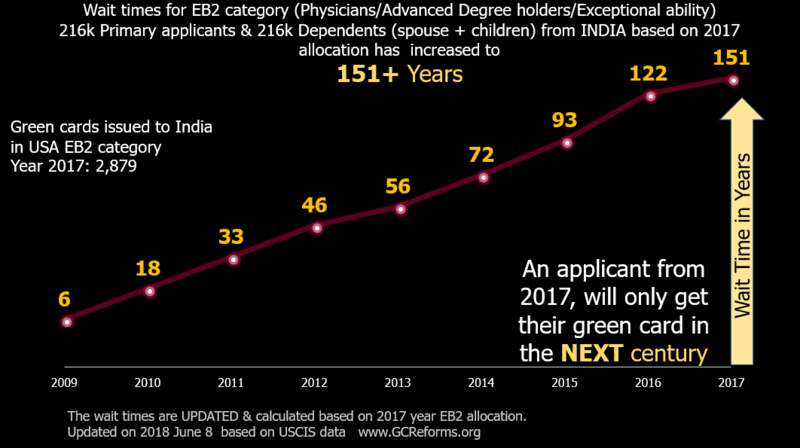 Green cards impacting their Job mobility, spouse work authorization, Aging out of Indian born kids and Displacement of American born kids! 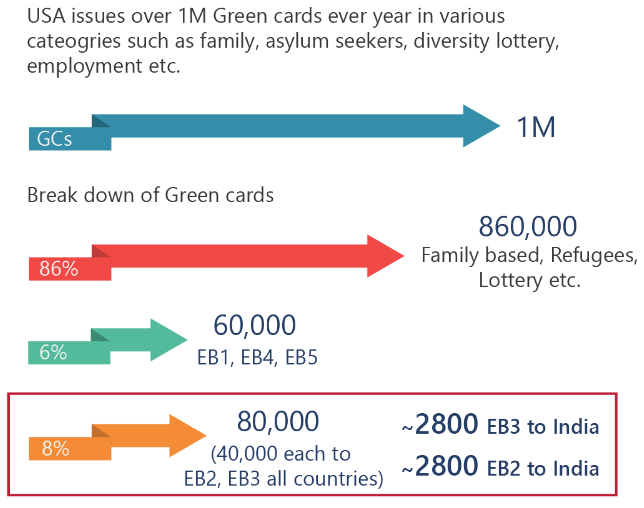 270,000 high skilled immigrants and their families are stuck in the Green Card backlog. 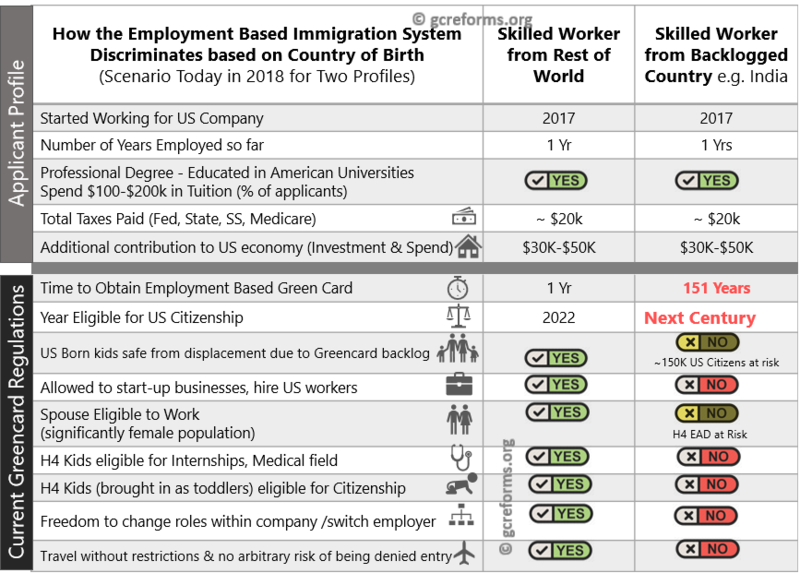 See how the current immigration system treats two skilled workers – one from most countries and another from back-logged countries such as India. Common sense and bi-partisan solutions are already available. Bill HR 1044( A bill to amend the Immigration and Nationality Act to eliminate the per-country numerical limitation for employment immigrants) has more than 100 co-sponsors, the support of leading organizations and large companies. Eliminating per country limits redistributes green cards based on application date rather than country of birth. 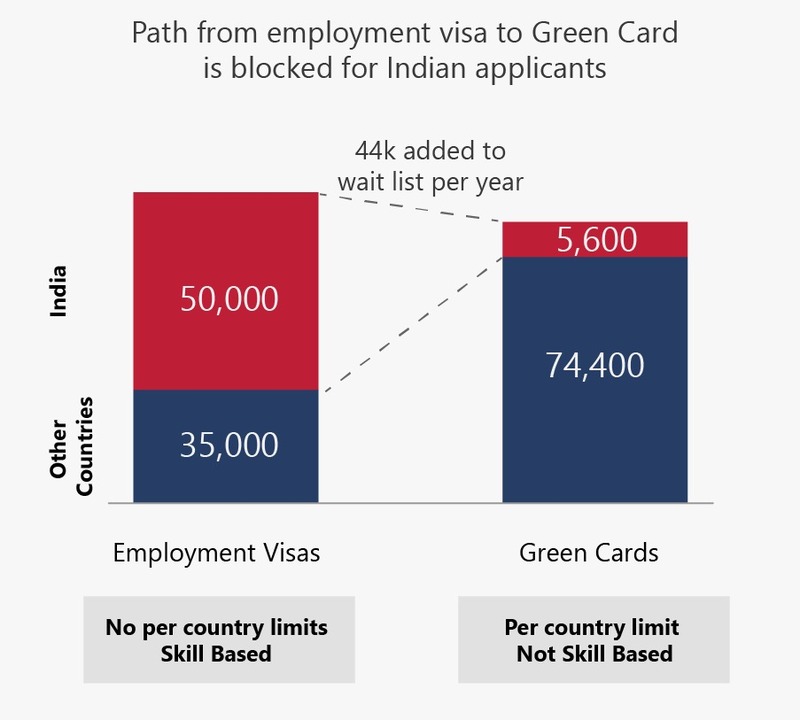 It does not increase the total number of green cards issued in the employment category. Visa recapture provision from bills such as S744, passed in 2013 Senate with bi-partisan support, need to be brought back into current immigration discussion.